Come with Metro-Events and you’ll be in a party of pure imagination! Throw the most delicious party EVER!!!! Throw your own Charlie and the Chocolate Factory party with party supplies and decorations. So many ideas and so little time for them all! Who doesn’t love chocolate? Digital Party Supplies, invitations, party favors and more! Imagine the smiles and fun your child with have with this bright and tasty chocolate factory party! I created these party supplies because growing up “Charlie and The Chocolate Factory” was one of my favorite movies. I use to dream of walking alongside Willy Wonka through his amazingly delicious chocolate factory and now anyone can do that with these party decorations. Get your own golden ticket to give to your special guest so they know they are in for a tasty treat before arriving at your Chocolate factory party! I Saw A Butterfly, Way Up In The Sky With Beautiful Wings, It Flew Right By…These awesome Butterfly Party Supplies! No need to flutter about looking for what you need when you can shop from home and have discount Butterfly Party Supplies sent directly to your door. Butterfly Party Supplies are perfect for girls of all ages. The pastel spring style pattern features sweet butterflies with outstandingly beautiful wings, surrounded by colorful spring flowers. Pick up some coordinating paper plates, paper cups, custom cookies, invitations and more! Choose from printed custom party supplies or digital files available on Metro-Events party shop. 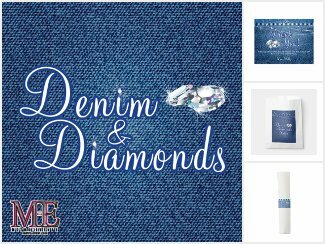 Denim and Diamonds Party Supplies and Favors, this party collection can be customized for any type of party: Birthday, Bridal shower, Bachelorette Party, Wedding or just a gathering with friends. I really like this party collection, the idea came a friend of mine it’s a really versatile set of party decorations. The party collection offers the best way to throw a party that is both glitzy and entertaining! Have guests show up in diamond studded blue jeans or denim formal wear to match your party’s theme! The sparkling bling you’ve used to decorate your space will wow guests upon entering the room, as they eagerly show off their new denim and diamond look to friends. The Denim and Diamonds Party Invitations are available on both Metro-Event’s Zazzle shop and Metro-Events on Etsy. Choose either prints or Digital files to print yourself. Also available are custom party banners, thank you cards, custom cookies, party gifts, party favors and many other party decorations and supplies. A bit of a different twist to a timeless theme. I have been wanting to design a luau themed party for quite a long time now but I wanted it to be different from what is available. Most party supplies that I see are really bright colors with the common tiki and hibiscus flowers. 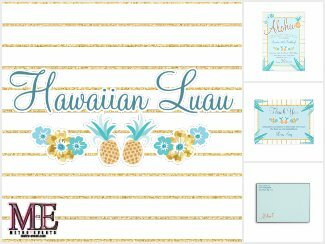 Although I do love the bright colors that are commonly used for luau parties I wanted to offer something that could give an alternative to the bright colors since everyone has different things that they like. 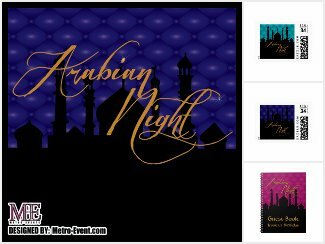 Metro-Events on Zazzle offers: address labels, thank you cards, envelopes, napkins, cups, paper plates and more! Questions about printing and paper is very common, this post will cover different resources and types of paper to use for your printable party decorations. Metro-Events currently offers printing for thank you cards, invitations vinyl banners and posters. Metro-Events uses professional printing resources for printing these items, the printers set the quantities and metro-events does not have the option to change the print quantities that are available. For the invitations and thank you cards, they are sold to me in increments of 25. For the banners & posters these can be sold in single prints. Metro-Events only charge for the design services the print costs are that of the printers. ● Printed thank you cards are printed on 14pt premium card stock, the front of the card is matte so you can write a special note if needed. The back of the card has a UV gloss coating so you will not be able to write on it. ● Printed invitations 14pt premium card stock with full UV protective gloss coating. The invitations and thank you cards do not come with envelopes, this is the printers policies. Metro-Events recommends purchasing envelopes at envelopemall.com. ● 5″x7″ size invitations the size envelopes you will need is an A7. ● 4″x6″ size invitations the size envelopes you will need is an A6. PLEASE NOTE: Metro-Events does NOT customize labels for different types of template labels. The reason for this is because of all the variables available with different templates labels. It is recommended that you purchase single full sheet labels then cut them to size. You don’t have to spend a ton of money on paper to get good quality. After testing out different papers throughout the years I have actually found that some of the more expensive papers do not produce as good of quality prints. My personal Favorite papers are listing. For double-sided printing of the invitations make sure you get double-sided paper. The heavy weight paper that I have recommended is double-sided so you can use that. Double-sided printing can be tricky, every time I print double-sided I forget which way I am suppose to load the paper and I have been doing this for years! So what I do to save ink & paper is a test print with a basic word file. ● Step one print a word file on cheap paper, make sure that word file has one word on it so you can see the direction when you print the second side. ● Step two put the paper back into the printer and print that word again, if it’s on the opposite side of the paper and facing the right direction then you know how to load the paper… you just have to pay attention to how you did it! If it is upside down and on the same side as the first print you know that you have to change the direction of the paper so just try again. ● The key is to pay attention to the direction you are loading the paper, as long as you note what you are doing then you will eventually get it right. Once you know then you can print your actual file and not waste ink or paper! I will continue this series of hints to help out so please check back on Metro-Designs & Event Services blog for more later! Please comment for questions or feel free to email! 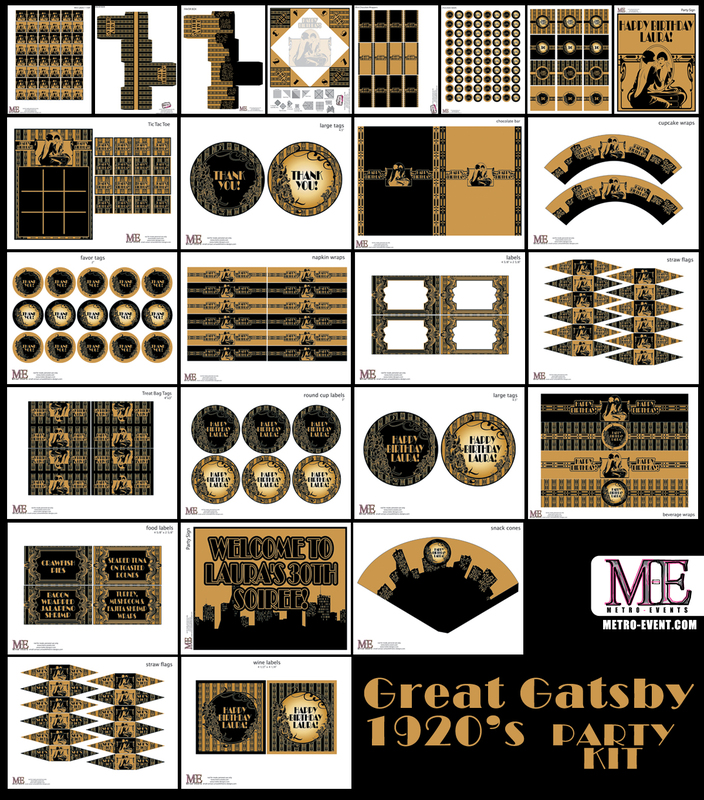 These party decorations were created for New Years Eve 2014, since it’s a vintage style party designs it’s in some ways timeless, I always love timeless designs. 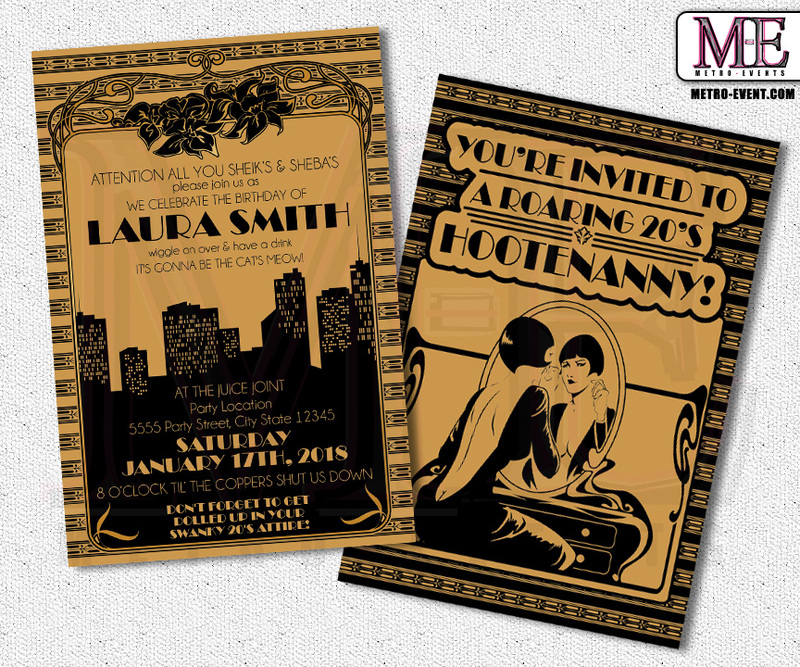 The vintage art deco/ art nouveau period of art history has always been one of my favorite eras so I thought it would be great to create a design for New Years Eve party inspired by it. New Years Eve Party Decorations. The items shown in this photo collage are: Large Chocolate Bar Wrappers, Mini “1 Labels, 3″ Round Labels, 3/4” Labels for Hersey Kisses, New Years Eve Banner, Straw Flags, Mini Chocolate Wrappers, NYE Party Sign. All of the glass items used were from the dollar store! I just spray painted them with gold spray paint. I couldn’t find gold glass in the store and I didn’t want plastic. Since I could not bring myself to spray paint something that cost very much money the dollar store turned out to be the perfect place to find glass! I spray paint EVERYTHING! If you get Rustoleum spray paint it will work for just about anything. Over the summer I had found this really cool old metal scale at a flee market for $10! I Spray painted it gold and used it to hold some of the chocolates. This was probably one of my favorite decorative pieces that was used in the party. New Years Eve Party Decorations. 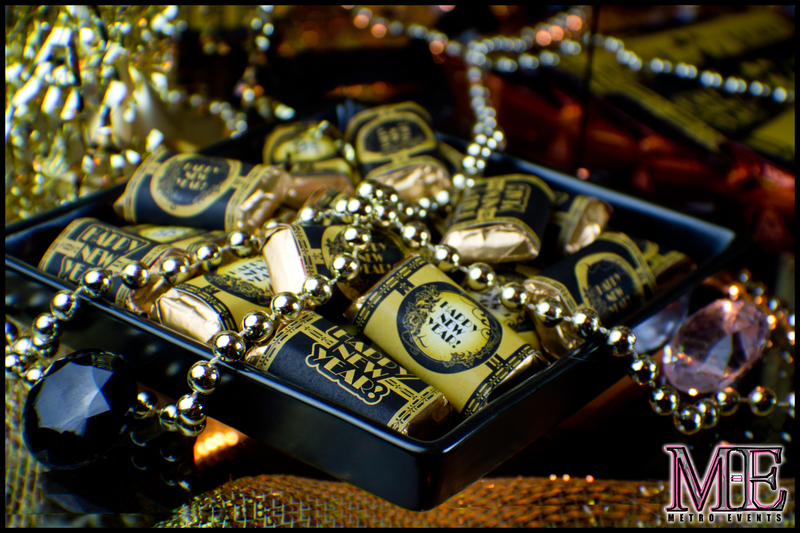 The items shown in this photo: 3/4″ Labels for Hersey Kisses, I actually used rolos for this because of the gold foil on the candy. I also made the black “dip stands” I picked up little plant pots from hobby lobby then glued and painted them. Shown in photo as dip-cup stands. I have also used these for cupcake stands, mini candy dishes and mini cookie dishes. Black “dip stands” Made from mini terracotta pots. Party Decorations featured: Favor tags & cupcake toppers. The black dish shown in this photo is a candle holder that I found at Ikea, they only cost $4.99! The party Decorations shown in this photo are straw flags… just because they are called straw flags doesn’t mean they have to be used on straws. I use these for a number of things: Shown here as toothpick flags. The black square dish shown in this photo is a candle holder that I found at Ikea, they only cost $3.99! The party Decorations shown in this photo are mini chocolate wrappers. After creating this design for New Years Eve, I received many requests for this to be a birthday design so this design is now available for a birthday as well as a New Years Eve Party. 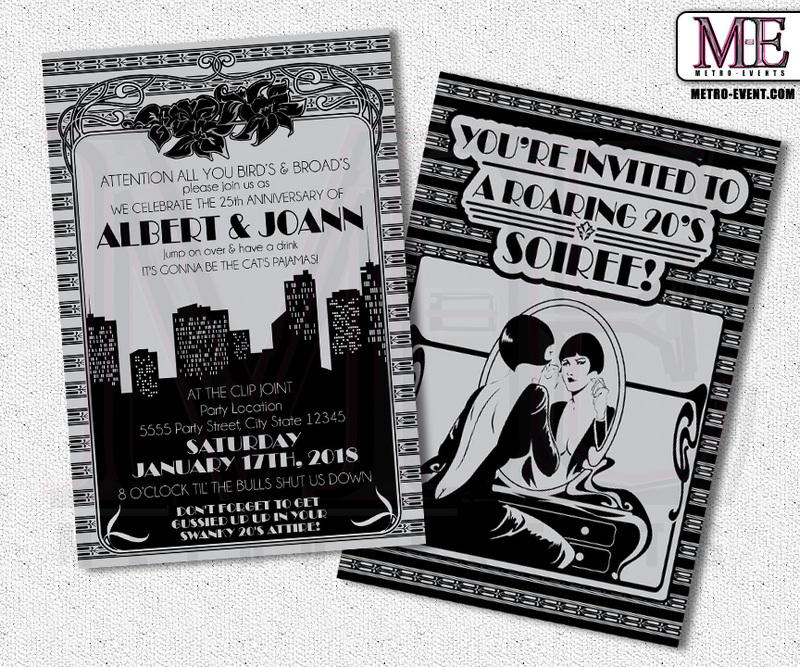 1920’s Party, Gatsby Banner, Art Deco Birthday, Flapper Birthday, 1920’s invitation, Party invitations, Adult Party. Metro-Designs, Event & Party Services! Creative & customized party/event supplies at reasonable prices. Invitations, Party Banners, Party Signs, Party Supplies, Party Decorations and more! Metro-Designs, Event & Party Services! Creative & customized party/event supplies at reasonable prices. Invitations, Party Banners, Party Signs, Party Supplies, Party Decorations and more! Please feel free to contact Metro-Event.com for any special requests. Metro-Events now has a “printable of the month club”. Subscribe to Metro-event.com and you will receive a free printable every month! Each month will be a new printable file as well as coupons to save on shop items. Metro-Events will also send tips in order to provide you with ways to style an awesome & budget friendly party! 1 party tip each month or sale items, so that is only 2 emails! Custom party designs, Birthday Invitations, Party Invitations, Theme Party Invitations, Baby Shower Invitations, Bridal Shower Invitations, Party Decorations, Party Banners, Birthday Banners, Birthday Bunting, Party Signs, Favor tags, Party Supplies, Thank You Cards, Favor Boxes, Party Stickers, Water Bottle Labels, Party Labels. Metro-Events is growing… it’s a slow climb but they say a steady pace wins the race! Shop at Metro-Event.com online, prices on our website are lower then the prices on Etsy yet the same value, party items & design quality is the same. Why does it cost less then Etsy? Simple, it doesn’t cost as much for us to post our products on our site. If you want to save money on your Invitations, Party Banners, Party Signs, Party Supplies, Party Decorations and more shop on our website and save! Metro-Event.com.